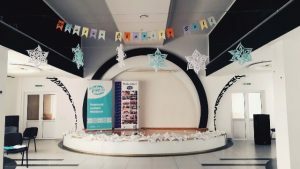 This year’s holiday season started with a celebration at the extraordinary black-tie Winter Charity Ball: Masquerade, organized by the Moldova FLEX Alumni community in partnership with the Creative Development Association and the Gender Center. On December 23, the Republican Center for Children and Youth in Chisinau was transformed to create a stunning venue and a night to remember for the event’s 150 guests. 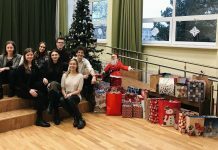 Organizers of the Winter Charity Ball set the goal of raising money from ticket sales to help a young family with two children from Chisinau, whose father sustained injuries after he found an anti-tank grenade that exploded in his hand. In total, the alumni raised $380 to donate to the family. Guests at the event were entertained by local stars like famous Moldovan singers Mark Stam and Felicia Dunaf. 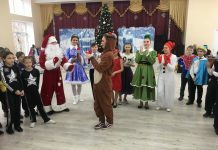 The program included activities for adults and children, with the latter having the opportunity to make decorations for their Christmas trees, paint ceramic bells, and take pictures with Santa and the Snow Maiden, a regional figure who assists Santa in handing out presents. The talented painter Gabriela Buzu also surprised the visitors with creative caricatures. 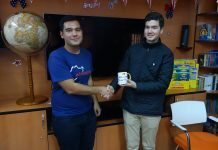 Those present at the event participated in a raffle and many lucky people left the event with gifts offered by the event’s partners: Avon Moldova, Esushi, Creative Development Association, Motiko, MonstrCard, and Akkurati. “I wanted to organize an event like this one for a long time, and finally I had the courage to do it this year. 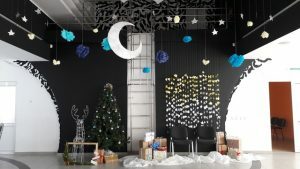 Together with the other co-organizers, partners, and volunteers, we managed to create a fairytale, holiday event. 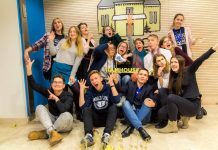 I hope that the Winter Charity Ball will become an annual tradition,” shared Victoria Lungu ’13 (Chisinau, Moldova/ Columbia, MD), FLEX Alumni Coordinator in Moldova and the organizer of the event.